Moroccanoil recently launched a brand new line of argan oil-infused skin products: Moroccanoil body! The products in this collection are designed to instantly transform skin and leave it feeling smooth, soft and radiant. I keep hearing about the benefits of argan oil and how it works wonders on both skin and hair. I may have oily skin on my face, but I have dry skin everywhere else. This winter has been especially hard on my skin. My poor hands which were once so soft are now rough and dry. They need some major TLC. 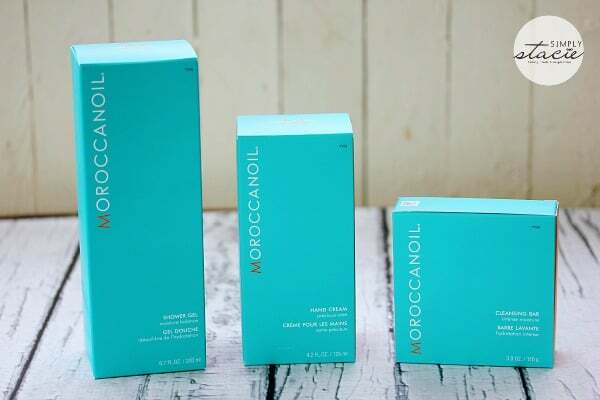 I had a chance to try out three of the Moroccanoil body products. The Moroccanoil Hand Cream was my favourite. It intensely hydrates your skin with cocoa, shea, mango and avocado butters and of course, argan oil. I love feeling it absorb and soothe my dry, irritated hands. It’s also not greasy and has a nice, light scent. My hands looked and felt 100x better! I’m keeping it in my purse to apply throughout the day. I’m determined to restore the soft skin! John has been using the Moroccanoil Body Shower Gel and likes that it doesn’t have a “girly” scent. His words. This shower gel cleanses and hydrates skin restoring moisture improving elasticity, texture and tone. It contains argan oil and glycerin and has the signature Moroccanoil fragrance. He always smells so good after his shower! The Moroccanoil Cleansing Bar is mild and can be used on all skin types. It contains argan oil, shea butter, glycerin and talc from Luzenac (a natural mineral that helps to control sweat and odour). It lathers up nicely in a warm water and has the signature Moroccanoil scent. My skin feels so soft afterwards! You can find Moroccanoil body products at luxury spas and fine salons across the country. They are also sold at Ben and Tournesol in Montreal. In terms of SRP, Moroccanoil Hand Cream is $28 (125 ml)/$18 (75 ml), Moroccanoil Body Shower Gel is $26 (200 ml) and Moroccanoil Cleansing Bar is $10 (110 g). Connect with Moroccanoil on Facebook, Twitter, Instagram and YouTube. My hands are in and out of gloves all day and constantly washing them. I’m interested in trying the Moroccanoil Hand Cream. Thanks for testing it and giving such a good review. thanks for a good review. This sounds like something I could use, the skin on my legs is always so dry. The winter was pretty rough on my hands, plus all the hand washing between diaper changes and preparing food, my hands are always so dry. I’ll have to remember this line of products! I would love to try this on my skin, I need softer skin. It always is dry or cracking in the winter months. I will have to check out their line of wonderful products. Thanks for sharing it. Sounds lovely. I have very dry skin myself. I have dry irritated hands to so the hand cream would be awesome. I’ll have to look for it! This sounds like great products. I really need to try the Moroccanoil Hand Cream. It’s not a bad price considering I keep buying all different kinds of hand cream to try. I hate how dry and sore my hands get especially in the winter. I have horrible eczema in just the tops of my hands…I would love to try this and see if it would work..nothing else does! (moroccanoil body review) I have never heard of this product before, I like that they have many different things to choose from and try. I would really like to try that handcream out. Argan oil really is so good for dry skin. This sounds like a great version, and I like that the scent isn’t too floral and feminine. The hand cream sounds awesome! My hands have had a hard winter too…. These products sound lovely. I would like to try them! Have not tried argan oil — thank you for this review! ohhh I would like to try the hand lotion!! I LOVE Moroccan Oil for my hair so I know I would love it for body!! Moroccanoil Body sounds like a wonderfully hydrating skin care line. I would love to try the hand cream, and I bet the products smell amazing. Thank you for sharing this review. These products sound wonderful! My skin has been so dry since winter started and it drives me crazy! I would love to try these products! sounds nice but kind of pricey! I’ve heard about the wonders of the hair products but was unaware of the products for the body. Like you I’ve got horribly dry hands from the winter PLUS we don’t have a dishwasher (well we do, but it’s me) and I don’t like washing dishes wearing rubber gloves so it’s hard to keep my hands from drying out. This sounds like something I’d enjoy using. I am looking for new skincare, so I may have to try this! It sounds like top notch skincare! These products sound lovely. I too can definitely use the hand lotion. My skin is quite dry after this winter we had. I always like the effect of argan oil on my skin. I love hearing or, in this case, reading unbiased opinions of new products. As someone with very sensitive skin, I’m always on the lookout for products that work well while not causing a reaction on my skin. I have never heard of this product before but your review is wonderful so I can learn more about the product. I have never used oil infused products before so will have to give it a try. I have used moroccanoil on my hair but did not know they have body care as well. I will check them out myself, especially the hand lotion.